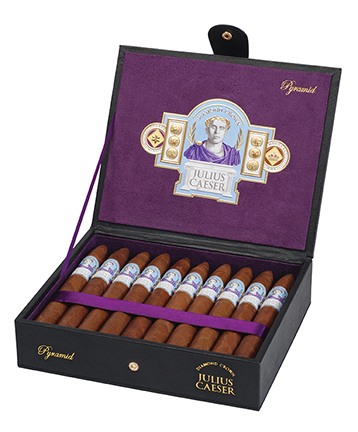 The Diamond Crown Julius Caeser* line of cigars honors the cigar pioneer and founder of the J.C. Newman Cigar Company, Julius Caeser (J.C.) Newman. To celebrate J.C.'s 135th birthday and the company's 115th anniversary, Eric and Bobby Newman created this third Diamond Crown cigar that honors their grandfather whose likeness appears on the cigar's label. Diamond Crown Julius Caeser cigars are meticulously hand rolled in small batches at Tabacalera A. Fuente in the Dominican Republic. The particularly flavorful Ecuadorian Havana-seed wrapper combines with a smooth and robust blend of fine Central American tobaccos aged 5 years to give the Julius Caeser cigar its bold, rich, and distinctive flavor. Cigar connoisseurs will experience a rich, coffee-laden smoke balanced by sweet and spicy woody flavors with a savory finish. Representing four generations of family tradition, these exceptional medium-bodied cigars are presented in a leather-bound box of 20. * When J.C. Newman immigrated to the United States from Hungary, he was informed that a middle name was necessary and "Caesar" was suggested. The name was misspelled on his legal paperwork as "Caeser" and was never changed.